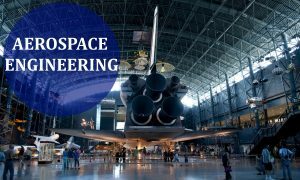 Aerospace Engineering is one of the most fascinating subjects having two main branches of aeronautics and astronautics, which also have sub-branches amongst themselves. While aeronautical engineering specialises in aircraft, helicopters, unmanned aerial vehicles and missiles (basically everything that flies within the limits of Earth’s atmosphere), astronautical engineering includes rockets, satellites, space stations, space shuttles and spacecraft that fly beyond Earth’s atmosphere. The scope for aerospace engineering is literally beyond stars. An aerospace engineer designs, tests, constructs and maintains aircraft and spacecraft. In India, the industry is one of the fastest growing with civil, defense and space segments showing significant growth potential. Planes and helicopters carrying people fly across the skies in Earth’s atmosphere. India’s civil aviation industry is on a high-growth trajectory due to fast economic growth in recent years and sizeable increase in real consumer spending. Airlines flew nearly 100 million passengers on domestic routes last year. The government has ushered in a new era of expansion – driven by low-cost carriers, modern airports, foreign direct investments and growing emphasis on regional connectivity. The air transport sector already supports eight million jobs and contributes 72 billion dollars to the GDP. According to International Air Transport Association (IATA), India will displace Britain to be the third largest aviation market with 278 million passengers in 2026. In 2035, IATA expects the Indian market to serve 442 million passengers and rank as the world’s largest aviation market. US plane maker forecasts that Indian airlines will need 1,850 new planes valued at 265 billion dollars in the next 20 years, churning up huge demand for pilots, aircraft maintenance engineers and ground handling staff. In addition, Indian engineers are well known for their skills and many of them provide their work to foreign aeronautics companies outsourcing their work to India. This is also expected to increase with the growth of the domestic and international aviation sector. Phenomenal transformations are taking place globally with commercial space travel likely to become reality in the next five years. Private companies, government agencies and educational institutions are collaborating to accelerate human transition into a sustainable multi-planetary species. Moon Express, the first private company in history to receive government permission to travel beyond Earth’s orbit, is planning its maiden lunar mission to take place in late 2017. Naveen Jain, its billionaire co-founder and former Microsoft employee, hopes to find water, Helium-3, gold, platinum and rare earth metals on the surface. Bengaluru-based Team Indus, which was India’s first and only startup to have received one million dollars from Google Lunar XPrize last year and it too seems set to create history. By next Republic Day – on January 26, 2018 – the startup plans to land its first spacecraft on the Moon, travel at least 500 metres on its surface, and send back images and videos. Team Indus also plans to put the Indian flag on the Moon’s surface on Republic Day. The spacecraft will be launched on December 28 aboard vehicle PSLV-XL in association with Indian Space Research Organisation (ISRO). After a successful Mars Orbiter Mission (MoM), ISRO is eyeing inter-planetary missions to Jupiter and Venus. It recently created a world record by launching 104 satellites at one go on board its vehicle PSLV-C37. The learnings will have immense benefits for oil exploration, increasing use of tele-medicines in remote areas and disaster mitigation missions in emergencies. Clearly, India is a strong player in space exploration and there will be lot of opportunities for young scientists, engineers and such professionals in future to work on fundamental functions. There is high demand and competition for good aerospace engineers in various streams. Job opportunities are available in airlines, helicopter companies, aviation companies, corporate research companies, the Air Force, Defense Ministry, Hindustan Aeronautics Limited, ISRO and many others. Plane manufacturers like Boeing and Airbus also have huge engineering centers in India as part of their global supply chains. While the country is home to a million engineering graduates every year, it is the industry readiness of this vast talent pool that will play a key role in achieving the vision of creating a scalable and sustainable aerospace ecosystem. The aerospace industry needs engineers with right technical skills combined with applicable soft skills. A background in mechanical, electrical and electronic engineering or mechatronics, materials (for example composites) and system integration knowledge is only the start. To build up such an ecosystem for aerospace, India needs technology and capability to cover the complete lifecycle of aerospace products encompassing research and development, engineering, manufacturing, testing and after-market services. Engineering talent needs to be trained and exposed to international experiences to spark innovation and creative thinking. Global skills make them receptive to world-class standards of safety and quality. Indian students must strive to get such experience for career advancement. The industry and government too should focus on deploying more funds for scholarships and training programmes to tackle these key challenges. Industry readiness of the graduates or diploma holders is vital to meet the needs of aerospace and defence industry – especially now when the government has launched ‘Make in India’ initiative to attract domestic and foreign investments, so that the country can emerge as a low-cost, high-quality manufacturing hub on the global horizon. Over the next two decades, aerospace engineering will extend its reach to serve societal needs domestically and globally in areas like health care for remote areas, energy efficiency, alternative energy, environmental sustainability, disaster mitigation and homeland security. Future engineers will thus move the industry to a new level with expanded markets and grand challenges. Many industry leaders and policy makers believe that passenger space travel will grow rapidly, creating new employment for millions of people and profoundly changing our daily life on Earth. Quite naturally, professional advancements will increasingly depend on the ability to succeed in international contexts. The writer is a Professor of Aerospace Engineering and Advisory Council Member at UN Centre for Space Science and Space Technology Education in Asia and Pacific (CSSTEAP).